Two Yle journalists took home awards at the Bonnier Grand Journalist Prize ceremony on Tuesday. Jessikka Aro won the story of the year award for her work exposing Russian trolls on social media, while Tom Kankkonen won the journalist of the year prize for his stories on Syria, Iraq and Turkey. Each of them took home a monetary prize worth 7,500 euros. Yle journalist Jessikka Aro won the story of the year award at Tuesday night’s Great Journalist Award for her work exposing Russia-backed trolls on social media. Yle’s Tom Kankkonen won the journalist of the year award for his work covering Syria, Turkey and Iraq. Among other stories, Kankkonen asked Turkey President Recep Tayyip Erdogan how he responds to accusations that he’s a dictator. Erdogan reportedly asked aides ‘which paper is he from’ before saying that such a question would be impossible in a dictatorship. 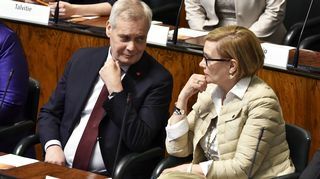 Aro’s series of articles about trolls on social media and in newspaper comment sections took the story of the year prize for its dissection of how commenters manage to subvert conversations about Russia in Finnish language online forums. She also visited a so-called ‘troll factory’ in Saint Petersburg to see where much of the pro-Russian comment originates. After the stories were published a campaign of intimidation and harassment intensified, with unknown individuals targeting Aro via SMS, phone calls, email and on social media. In one case she received a text message that was purportedly from her father who had died 20 years previously.